Hello! Today, I’m so excited and honored to share this interview with the super awesome Michelle Schroeder-Gardner of Making Sense of Cents. I’m a total Michelle fangirl (in case you can’t tell!) and I can’t tell you how thrilled I was to get the opportunity to interview her about her amazing course, Making Sense of Affiliate Marketing. I took her course Making Sense of Affiliate Marketing in August and I’ve watched my traffic climb, made my first few affiliate sales ever, and am seeing more engagement with my affiliate links every day. She has built a truly impressive blog + income through her blog using affiliate marketing and she tells you exactly how she does it in her course. Today, she’s sharing some of her tips with us for free! Big thanks to her!! Please give us a little background on yourself, how you started Making Sense of Cents, when did you go full time? Hello! My name is Michelle and I run Making Sense of Cents. I have three finance-related college degrees and I actually used to be a financial analyst. In the summer of 2011, I started my blog with the aim of teaching people the best money saving tips as well as journaling my personal finance journey after reading a magazine that featured a personal finance website in one of their articles. I got hooked on that website and my interest in blogging grew from there. This is funny because before August of 2011, I didn’t even know that blogs were around, what they were, that they could make money, or anything along those lines. I did not create my blog with the intention of making money online or anything like that. I created my blog all just as a hobby and an outlet I then realized how much I loved blogging and realized that it was for me, so now I am a full-time blogger! I went full-time in October of 2013. It’s funny how life can change so much. On Making Sense of Cents, I talk a lot about different ways to make extra income, money saving tips, how to start a blog, living your dream life, RVing (me and my husband RV full-time), and more. I love running Making Sense of Cents and I am very happy that this is now my full-time career, my business, and pretty much my life. Did you always know you wanted to monetize your blog or did that develop later? Why did you decide to go with affiliate marketing? Nope, not at all! I started my blog just as a hobby. I never thought of making money from it and I didn’t even know how blogs made money or that they could. I love earning affiliate income because it can be very passive, which allows me to focus on other things like life and other parts of my business. You can create just one blog post or social media post, and potentially earn money from it years down the line, as long as you maintain it and keep generating traffic to it. With affiliate marketing, I can enjoy life more and know that I am still able to earn a great living promoting products that I use and enjoy. Can you explain a little about what affiliate marketing is? Yes, of course! Affiliate marketing can sound confusing, but it’s a very easy concept. Affiliate marketing is when you earn income by placing affiliate link on your websites, social media account, influencer platform, etc. and have people purchase a product through your link. If you get someone to sign up through your affiliate link, you are then rewarded by the company for promoting their product. How has being location independent and traveling changed your business? What has it meant for your lifestyle to have a source of income like affiliate marketing? Location independence is great for both me and the business! We’ve been location independent for a few years, and me and my husband sold our house last year and we’ve been full-time traveling since. We absolutely love it. We get to work from wherever, all from the comfort of our home on wheels. And, this is why I love affiliate income. It allows me to have more time for other things in life that I love. When did you know it was the right time to create your AMAZING course? 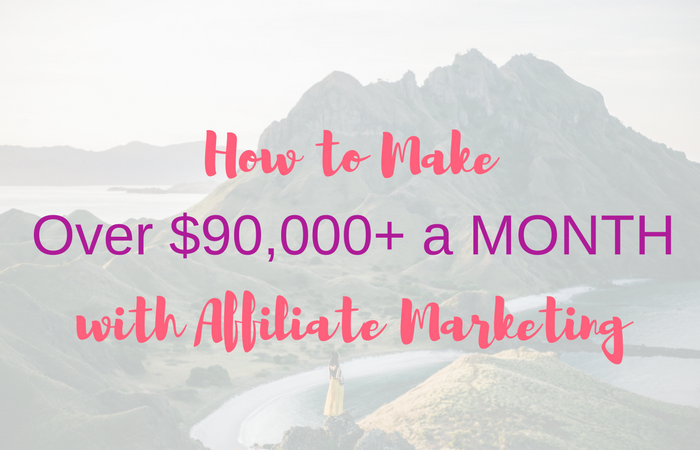 I decided to launch my Making Sense of Affiliate Marketing course because I was constantly being asked about affiliate marketing from readers and bloggers. What seemed normal and easy to me, isn’t easy for others, so I knew I had to create this course so that I could get my knowledge out. Affiliate marketing is great, and I want others to benefit from it as well! And, I’m so glad that I created this course. It has been very well received and I had a ton of fun creating it. Can you explain a little bit about what’s inside your course? An intro to affiliate marketing, what it is, the basics, etc. In Making Sense of Affiliate Marketing, there are 6 modules, over 30 lessons, several educational worksheets, bonuses, an extremely helpful and exclusive Facebook group, and more. I go through everything that you need to know about affiliate marketing, and more! Is affiliate marketing good for all levels of bloggers or should newbies wait? as a Brand New VA? Making Sense of Affiliate Marketing is an amazing learning tool and I highly recommend taking it, even if you are a brand new blogger. By taking this course, you will start off blogging the correct way. You can learn from my affiliate marketing mistakes and learn the best ways to start making an income by being an affiliate. Through taking this course you are sure to grow a profitable blog quicker than the average blogger, as you’ll learn exactly what you need to know about affiliate marketing. Even if you only have one blog post (or none! ), you are ready to get started with this course! Is there one tip or piece of advice you could give to people who are interested in making money online, especially with affiliate marketing? My top piece of advice that I want everyone to know is that anyone can make money through affiliate income, and you can do it in a non-salesy way. So many people are afraid of affiliate marketing because of two reasons: 1) They don’t think they have a large enough platform; 2) They are afraid of being too “salesy.” I have never had someone tell me that I’m salesy or pushy, and I’ve even had people ask me how I make money through affiliate marketing because they never see me try to sell things. By taking my course, you’ll learn exactly what you need to be doing in order to earn a great amount of affiliate income. Click here to check out Michelle’s course, Making Sense of Affiliate Marketing. Seriously, you guys, how cool is Michelle? If this full-time RV living, traveling finance whiz blogger boss at Making Sense of Cents doesn’t inspire you to get blogging and try affiliate marketing, I don’t know who or what will. Are you using affiliate marketing on your blog or biz? What was your biggest sale? My pleasure! Yes, she is a must follow & her course is super helpful. Thanks for stopping by! So happy to help, Galia! I know I wish I’d started with Affiliate Marketing way sooner. Thanks for stopping by! Wow, I’m impressed by Michelle’s earnings! I’m definitely not at the same level she is, but I did have a record month when I made $4,752 from 1 blog post in 1 month by tweaking and improving one of my most popular blog posts using something I call the Content Upcycle Method. I agree with Michelle that increasing conversions is a huge part of increasing your affiliate revenue, and that you’ll earn more when you set out to HELP your readers rather than simply SELL to them. I can totally recommend it as well. It helps big time to have guidance. The course is easy to follow through. And suddenly you feel instead of chopsticks you’re finally given the tools to be successful. Even if you would not manage to do so, Michelle is available in the facebook group to help you out. You could not have been recommending a better affiliate course. P.S. : I am still curious, how did you find out about Michelle’s course, Ali?